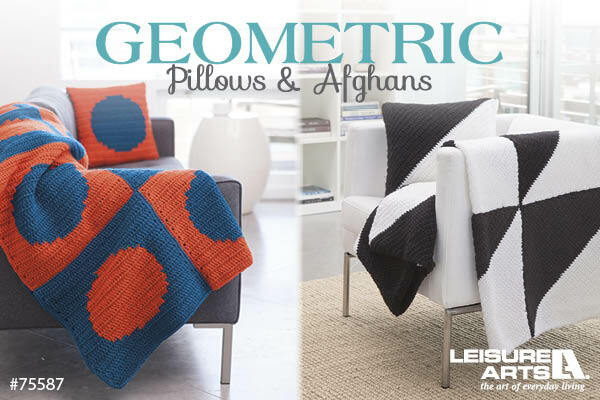 The Simple Rectangular Granny Blanket is a variation on the traditional granny square pattern that can easily be adjusted to your preferred size. I added a chain space border (with easy instructions for adding more border rows, if you’d like) for a simple but decorative edging. This post contains affiliate links. I may receive compensation (at no added cost to you) if you make a purchase using these links.Yarn for the sample was generously provided by Red Heart. One of the very exciting perks of being one of the Red Heart Joy Creators is getting to try out new yarns. A few weeks ago, I came home to a box including two skeins of the new Red Heart Super Saver Ombré yarn. I was already making plans for Granny Square Month, and I knew the Ombré would be a great fit. One of the challenges when making large projects with many color changes is weaving in so many ends. I knew this yarn would be perfect for a bigger granny project, especially since it comes in such large skeins. It does all the colorwork for you! Right now, Super Saver Ombré is available in 12 colors in 10 ounce skeins where the color moves from light to dark and back again in a self-striping, gradient pattern. I prefer to join my granny squares and rectangles with single crochet stitches, rather than slip stitches, because then I can start the next round in a chain space. I think this makes the project look cleaner at the edges. If you do decide to change colors, it also makes those color changes smoother. I took the blanket on an urban photography journey because I thought the colors looked great against the greens and greys of the park. I hope you think so, too. This post is part of my 30-day celebration of granny squares. Get more information about Granny Square Month here. If you make your own Simple Rectangular Granny Blanket, I’d love to see it! Share your progress and questions by tagging me on Facebook as @Underground Crafter, Instragram as @ucrafter, or Twitter as @ucrafter. Sign up for my weekly newsletter and get a coupon code for your choice of one of my premium patterns and other subscriber goodies. Plus, you’ll never miss one of my free patterns again! Add the Simple Rectangular Granny Blanket to your Ravelry favorites or queue. This rectangular variation on the traditional granny square pattern can easily be adjusted to your preferred size. A simple chain space border adds a finishing touch. Use a self-striping ombré yarn to create beautiful color changes without having to weave in ends. Baby Blanket: 30” (76 cm) width x 36” (91.5 cm) length. Red Heart Super Saver Ombré yarn (100% acrylic, 10 oz/283 g/482 yd/441 m) – 3 skeins in 3967 Sea Coral, or approximately 1,075 yd (983 m) in any medium weight yarn. PLEASE NOTE: I used just under 2 skeins of yarn for this project, so if your gauge is different than mine, you may run out before finishing. That’s why I recommend getting 3 skeins just in case. 16 sts (4 sets of 3 dc + ch-1 sp) = 4” (10 cm) in pattern. Exact gauge is not critical for this project. To keep the ombré pattern consistent, start new ball(s) of yarn with the same or next color in the sequence. Entire project is crocheted in the round with the right (front) side facing up. For a larger border, repeat Round 5, adding 2 more chains to corner chain spaces with each Round. Ch 18 (or any multiple of 4 sts, + 6). Round 1: Sk 3 ch (counts as dc), (2 dc, ch 2, 3 dc, ch 2, 3 dc) in next ch, *(ch 1, sk 1 ch, dc in next 3 ch) around to last 2 ch, ch 1, sk 1 ch,** [(3 dc, ch 2) twice, 3 dc] in next ch, begin working on opposite side of foundation ch and rep from * to * around to last ch, sk 1 ch, sc (counts as ch-1 sp) to top of ch 3 to join. Round 2: Ch 3 (counts as dc, here and throughout), 2 dc in same ch-1 sp, [(ch 1, 3 dc, ch 2, 3 dc) in next ch-2 sp] twice, *(ch 1, 3 dc in next ch-1 sp) around** to corner ch-2 sp, [(ch 1, 3 dc, ch 2, 3 dc) in next ch-2 sp] twice; rep from * through last ch-1 sp , sc (counts as ch-1 sp) to top of ch 3 to join. Round 3: Ch 3, 2 dc in same ch-1 sp, *[(ch 1, 3 dc in next ch-1 sp) around** to corner ch-2 sp, (ch 1, 3 dc, ch 2, 3 dc) in next ch-2 sp] 4 times, rep from * to ** around through last ch-1 sp, sc (counts as ch-1 sp) to top of ch 3 to join. Rep Round 3 until blanket measures approximately 34” (86.5 cm) across long edge, or desired length before border. Round 2: Sl st in next 2 sts, ch 1, sc in same st, ch 3, sk 3 sts, *[(sc in next st, ch 3, sk 3 sts) around** to corner ch-1 sp, (sc, ch 1, sc) in ch-1 sp, ch 3, sk 3 sts] 4 times; rep from * to ** around, join with sl st to first sc. Round 3: Ch 1, sc in same st, *ch 3, sk ch-sp, sc in next st around; rep from * to last ch-3 sp, ch 3, sk ch-3 sp, sl st to first sc. Round 4: Ch 1, sc in same st, *[(ch 3, sk ch-3 sp, sc in next st) around** to corner ch-3 sp, ch 5, sk ch-3 sp, sc in next st] 4 times, rep from * to ** to last ch-3 sp, ch 3, sk ch-3 sp, sl st to first sc. Round 5: Ch 1, sc in same st, *[(ch 3, sk ch-3 sp, sc in next st) around** to corner ch-5 sp, ch 7, sk ch-5 sp, sc in next st] 4 times, rep from * to ** to last ch-3 sp, ch 3, sk ch-3 sp, sl st to first sc. Fasten off. © 2017 by Marie Segares (Underground Crafter). This pattern is for personal use only. You may use the pattern to make unlimited items for yourself, for charity, or to give as gifts. You may sell items you personally make by hand from this pattern. Do not violate Marie’s copyright by distributing this pattern or the photos in any form, including but not limited to scanning, photocopying, emailing, or posting on a website or internet discussion group. If you want to share the pattern, point your friends to this link: http://undergroundcrafter.com/blog/2017/06/02/crochet-pattern-simple-rectangular-granny-blanket. Thanks for supporting indie designers! This is the first I’ve seen that yarn, and it is AWESOME. I can’t wait to try it out! I agree with you on joining with a single crochet… It makes a much nicer join. Featuring your crochet post at Snickerdoodle Create Bake Make Link Party today!